Ask the Aquarium: Where have the anemones gone? Bristol Aquarium is a centre for education, leisure and entertainment. We share our knowledge of the oceans to inspire the next generation of budding enthusiasts, talking about the fascinating creatures that live in our seas and the issues that they face on a daily basis. As we are asked such interesting visitor questions we thought it was important to share a selection of these answers with everyone. Where have the anemones gone? At Bristol Aquarium we have a rockpool exhibit filled with creatures such as sea cucumbers, starfish, crabs and gobies but one particular resident of our rockpool caught the eye of one of our visitors – the Strawberry Anemone (Actinia fragacea). We had a chat with Rachel from Devon, UK, who told us that she used to see these brightly coloured anemones as common residents of her local rockpools however as time passed she noticed that she no longer saw them and so she asked us why this may be. Rockpools are fascinating ecosystems, existing completely submerged during high tide with an open flow of nutrients and then during low tide they become completely disconnected from the sea with a closed flow of nutrients for hours at a time. Many contemporary studies are focussing their attentions to the effects of climate change on species and their environments. 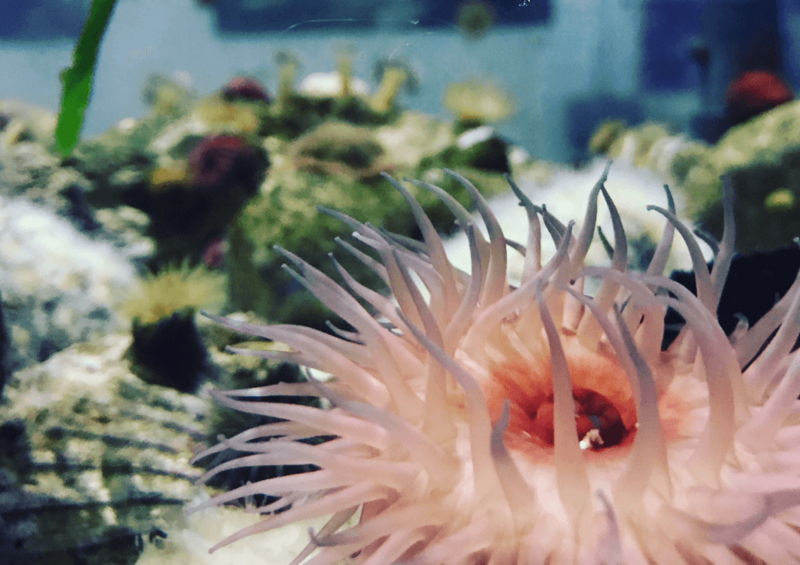 Anemones are special because, like coral, many have a symbiotic relationship with algae known as zooxanthellae which photosynthesise to gain energy from the sun. Zooxanthellae are sensitive to changes in the environment and studies have shown that fluctuations in temperature and acidity in the environment can disturb this symbiotic relationship leading to species loss (Fisher, 2017; Jones, 1997). Losses in species diversity can be caused by direct pollution run-off in the area. Like with many of our beautiful beaches in the UK, Devon’s beaches are usually rated as outstandingly clean places however there have been a couple of recent reports about sewage spills in the general area (e.g. http://www.northdevongazette.co.uk/news/raw-sewage-spills-on-north-devon-beaches-1-4307366 ). Sewage can run down currents and affect sensitive species along the way and may cause a displacement of species in their local habitats. Food availability can be a strong cause for movement of species. If the abundance of food decreases significantly in an area (either through population decrease or through displacement) then this would also cause creatures higher on the food chain to move location. It is often difficult to say for certain what the cause of a problem is without a study being conducted however we can draw some possible outcomes based on looking at wider implications such as changes in water qualities and food availability. Locally-organised beach cleans occur across the UK managed by the Marine Conservation Society (MCS), and Surfers Against Sewage run beach cleans that you can join with or you can even organise your own if there is not one set up in your local area (https://www.mcsuk.org/beachwatch/ or https://www.sas.org.uk/our-work/beach-cleans/). Even picking up any bits of litter on a trip to the beach can make a big difference especially when other members of the public see you do it and this then would raise their own self-awareness. There’s always a way we can help the environment even if it is a small step at a time!